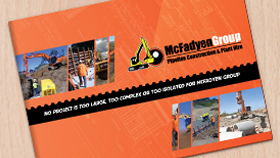 McFadyen Group - McFadyen Group is a premier provider of excavator hire in NSW & across AU. Our service comes at a competitive rate & with Dry & Wet Hire options. McFadyen Group (MFG) is a leading Plant Hire and Pipeline Construction company, contracting out to large civil contractors, Government Departments and Local Authorities. With a growing economy, New South Wales is home to many large construction projects. MFG is proud to have assisted with many of these developments. Various other Pacific Highway Upgrades either underway or completed. To ensure major projects are completed efficiently, MFG offer both Wet and Dry Hire services. For both these types of hire, MFG provide well-maintained and modern Plant including a range of excavators suitable for any construction project. This product range includes excavators of up to 49 tonnes, therefore ensuring that MFG’s Clients can get the job done well, no matter what size the project may be. MFG also provides Combo Hire to ensure that any large project has access to all the Plant Hire necessary for its success. This can be multiple excavators or a mixture of excavators with other Plant, such as dozers or dump trucks. If a Client requires Wet Hire, MFG’s expert Operators are ready to assist. All of MFG’s Operators receive regular training, especially in operations of new Plant. For any organisation requiring an Excavator for hire in NSW, MFG offers superior Plant from reputable brands. MFG is the company of choice for large projects undertaken by governments, local authorities and Australia’s largest civil contractors. For more information on MFG’s excavators and other services, or to organise a quote, contact MFG today.